The Washington Post has collected predictions from various pundits for its Crystal Ball contest, just to give you an idea of what others are thinking as far as this election goes. For what it’s worth – and I haven’t spent a whole lot of time on this part – I think the popular vote total will be 50% Obama, 49% Romney, 1% other. And the Senate 52 Ds, 47 Rs, 1 I. 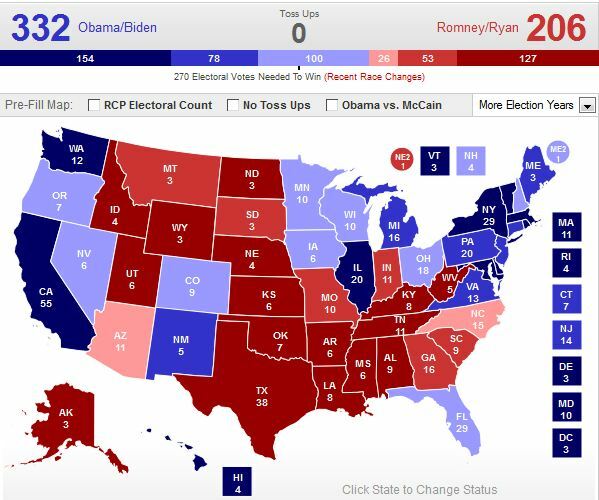 Yes, my map shows President Obama winning Virginia. I predict he will win by two points, aided by the 5-point win of Tim Kaine. Further, I expect all Congressional incumbents will be re-elected. The redistricting just shored up the districts for each of them, making challenges this year especially difficult. * – I will be a part of WAVY’s election night coverage, beginning at 7pm Tuesday evening. good guess on that electoral college! hope you’re doing well vivian!